25 youths, coming from all corners of the Caribbean took part in the ARDYIS Web 2.0 Training and Exchange Workshop from 27-31 July 2013 at the University of the West Indies in Cave Hill, Barbados. The event was organized by CTA and CAFAN in the framework of the YoBloCo Awards. From the beginning of the workshop, the excitement was palpable among the young Caribbean youths. Everyone remarked on the high quality of the training session and we were very excited to learn new skills and even more thrilled to be able to share them with other youth in our organizations back in our home countries. 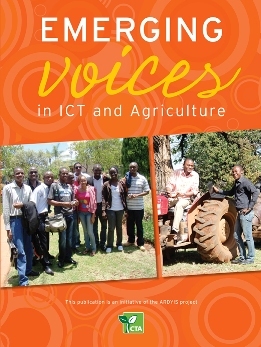 The new booklet published by the Technical Centre for Agricultural and Rural Cooperation (CTA ACP-EU) features 20 young people and three organizations, that have been involved in the CTA youth project called ARDYIS (Agriculture Rural Development and Youth in the Information Society). In addition to portraying authors and highlighting their perspectives on youth involvement in agriculture using ICTs, the document presents summaries of best essays submitted for the contest «Youth finding solutions to challenges in agriculture and rural development using ICTs!», organised in 2010; it also presents the results of the Youth in Agriculture Blog Competition (YoBloCo Awards) completed in 2012. YoBloCo Awards, individual category: Public evaluation results! We are pleased to announce the names of the 15 finalists for the YoBloCo Awards – individual category, resulting from the voting process that took place from 5 to 31 December 2011. During this period, for the individual category, we received a total of 2214 votes, from 2080 people (voting for two blogs was possible) and more than 600 comments for the institutional category. This is a great outcome, and we would like to thank voters and everyone again for your support and your interest in this initiative. The YoBloCo awards is a blog competition on Youth and agriculture launched by CTA in partnership with FARA, Yam-Pukri Association, CAFAN, AYF, ANAFE, SPC/PAFPNET, within the framework of ARDYIS project. This article presents the most frequently asked questions about the Awards.